The Antiquarian Booksellers' Association is delighted to announce that the winner of the third ABA National Book Collecting Prize goes to London University student Musa Igrek, for his collection of propaganda in the 1950s and 1960s. The £1,000 Annual Prize for student book-collectors, sponsored by the Antiquarian Booksellers’ Association, will be awarded to the winner at the ABA Chelsea Rare Book Fair, on Friday 2 November, at Chelsea Town Old Hall. Half of the prize money is for the winner to expand his collection and half is to donate volumes for the University Library. The quality of all of the entrants was once again extremely high, with the submissions prompting quite a debate. Musa’s passion and originality for his collection ‘‘Divine Power - the Red Shelf’ shone through, however, with the judges deeming it to have great potential for the future. The IRD was tasked with promoting Western Democracy and the ‘British Way of Life’ - Orwell’s Animal Farm and 1984 were translated into Eastern European languages with the support of the IRD. In Britain, more than a hundred titles were published by seemingly independent publishers such as Ampersand, Batchworth Press, Phoenix House and Bodley Head. This, perhaps timely, collection won against high quality entries from students at Aberdeen (‘Pursuit of Knowledge 1790-1850’ focusing upon books read by the Bronte sisters); Oxford (‘One Very Nonsensical Collection’ - Russian and Slavic translation of Edward Lear and other ‘nonsense’ literature); St Andrews (‘Staging and Stories: Twentieth-Century Pageants’) and Edinburgh (’Vintage American Cookbooks, Recipe Booklets, and Pamphlets’). Two entries were highly commended this year: Cambridge ('Protests and Experiments in Revolution-Era Russian Poetry'), and York (‘Treacherous Tigers, Devoted Dogs: Animals in Print, c. 1700-1900’). Both extremely sophisticated collections. All the entries displayed great enthusiasm, passion, and bibliographical knowledge, and it is so inspiring to see the upcoming generation of young collectors creating unusual collections, with limited means, yet revelling from the thrill of finding hidden treasures. We feel confident that all will remain collectors for life, and that the wider book world will be hearing more for one or two of the class of 2018. 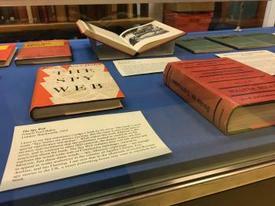 Some books from the collection of Musa Igrek are now on display in Senate House Library, University of London (Seng Tee Lee area, 4th Floor), together with some from the collection of Lucy Vinten-Mattach, co-winner of the University of London's Anthony Davis book collecting prize. The display will run until 23 November. Preparations for the 2018-19 Collecting Prize is already underway, with the winners from all partaking universities being considered for the ABA National Prize in September 2019. The Judges are: Deborah Coltham, Justin Croft and Brian Lake (booksellers), Ed Potten (independent researcher formerly of Cambridge University Library) and Lisa Baskin, (collector).